There are several great reasons to make your home more handicap accessible or “disability friendly”. You might be considering selling your home one day, or living in it yourself long term, in which case you might wish to consider your needs in your own old age. You might also make your home easier to live in for guests you might have with limitations. This article outlines some permanent and semi-permanent solutions for you. Is your home currently easy for a person in a walker or wheelchair to get into? You might consider ditching your stairs and providing a disability friendly ramp. 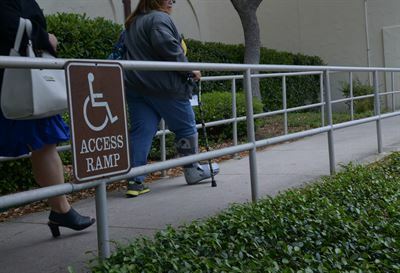 Depending on size and material, there are a wide range of ramp solutions at varying costs. If your door is on the ground level already, then your entrance should not rise above one-half inch and should be rounded for a wheelchair to easily roll over. Hardwood and tile floors without any rugs are ideals for wheelchair access, but you can also opt for a low-pile carpet. Stairs are also difficult for handicap people to use, so a lift that swivels will give your resident or guest a sense of independence they otherwise wouldn’t have if someone had to help them get up the stairs. You could also lessen their need to go up the stairs, by bringing anything they’d want there to the ground floor level. Recommended doorway widths for wheelchairs to access is 32”, but you can also provide a safer and more pleasant mobility without that cost by removing doors or by reversing the way in which a door opens. You can also lower the doorknobs for easier use. Kitchens are often challenging to someone faced with living with a disability, but there are a number of solutions to make their life easier. First, you can make sure that all appliances are easy to reach, lower counter tops, and install a lower sink if at all possible. Roll-out storage units are best for those living with a disability and making outlets available to their height. Shower stalls are much easier for a handicapped person to use. Provide them a seat and multiple bars for their safety, inside and outside of the shower. You can also ensure they are safe from scalding water by setting the hot water heater to 120 degrees Fahrenheit. I’m sure there are other ways you can discover how to best provide safety and independence to any disabled resident or guest you might have in your home. You can easily rent a wheelchair for a day and bring it home to see just how a person might feel touring your home in a wheelchair. Try to go about your usual routine and you will add plenty of things to your list of how to make life easier and your home more accessible! What Is Dishwasher Safe? What Should You Keep Under Your Bathroom Sink?